Saint Bernard Catholic School exists for one chief purpose: to give our children life in Christ Jesus as handed down to us through His Church. This belief defines our philosophy and guides everything that we do at Saint Bernard. We proclaim the Gospel of Jesus Christ to promote the highest ideals, to know right from wrong, and to do what is right. We encourage community service and prepare our students for the many challenges of life. 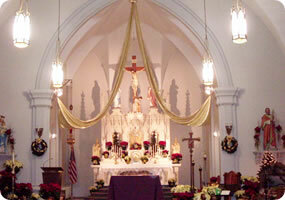 Our daily morning services feature student presiders, lectors, cantors and servers. This is an excellent opportunity for students to grow spiritually and develop leadership skills. We attend Mass on Wednesdays and Fridays, and Morning Prayer on Mondays, Tuesdays, and Thursdays. We pray the Rosary on the first Tuesday of each month. We pray the Way of the Cross on Fridays during Lent. Each Lenten season, we present an Outdoor Living Way of the Cross with student actors in costumes. Our entire school community attends this very moving re-enactment of the suffering of our Lord Jesus Christ. The performance is open to the public as well. Students attend religion class three times per week. Our religion teacher is highly qualified with 35 years of experience here at Saint Bernard. In addition to our daily gathering for Morning Prayer or Mass, spiritual enrichment in each classroom is evident and our students have the opportunity to pray and discuss their faith frequently and openly. We are committed to creating and preserving sacred spaces throughout our school campus. We have an outdoor prayer garden devoted to the Blessed Virgin Mary, as well as an area in the upstairs hall of the school dedicated to the Sacred Heart of Jesus. We prepare students for the Sacraments. Students in second grade spend the year preparing for their First Reconciliation and First Communion with the help of both their religion teacher and their classroom teacher. Opportunities for Reconciliation are provided often, particularly during Advent and Lent. Eighth grade students are encouraged to enter the Serra Club writing contest each year. The Serra Club’s mission is to foster, affirm and promote vocations to ministry in the Catholic Church. To know Christ – Through formal religious instruction as well as through the integration of faith into each and every academic subject area and social activity. To love Christ – Through participation in the sacramental life of the Church as well as through the constant guidance of the Holy Spirit within our community. To bring others to Christ – Through our witness as well as in answering the call to serve and help those in need within our community and abroad.